Custom artwork available upon request. Everything from wedding Invites to save the dates, pet portraits, holiday cards, baby announcements, nursery artwork, and more. Please contact me for quotes and details. A Wedding invite with personalized details to reflect the couple's favorite things. From the quote "It's All Happening" from the couple's favorite movie Almost Famous, to the red cardinals reflecting their Boston roots, to the flowers that matched their wedding bouquet, this invite was a charming representation of the couple and set the tone for the visual look of the wedding. Along with the invite, I provided illustrated place settings for each table, as well as menu cards. // Edit text to talk about wedding invites more generally. This series was a birthday gift for someone who wanted to surprise her best friend using photos of real life adventures between her and her dog, Paul. From eating ramen at their favorite noodle place, to playing poker, to a cross country road trip, this series made the perfect gift. // Talk more about process - i.e. took real photos and turned them into illustrations. Save the Date illustration using a realistic portrait of the couple surrounded by doodles of all their shared interests; from the SF Giants, to their alma maters, to basketball and beer. Watson the Wonder Dog series was originally supposed to be one portrait of Watson the dog driving the family’s favorite vintage car, but after playing around with colors, 4 individual paintings emerged and was presented by a mother to her son for his new apartment walls. A Holiday card for a family of 5 with their dog. Painted to the likeness of each person, using traditional holiday colors, this was the perfect card to send to friends and family. A mid century furniture loving owner and their dog. This particular chair and clock is a favorite of the architecture loving family, painted in simple 1950s style colors to match their home decor. This personalized poster was painted as a gift for an ACDC loving friend's baby nursery. What better wedding gift for two of my best friends than their dog Ted in a tuxedo matching the groomsmen and color scheme of their recent nuptials. This piece was painted as a baby shower gift. 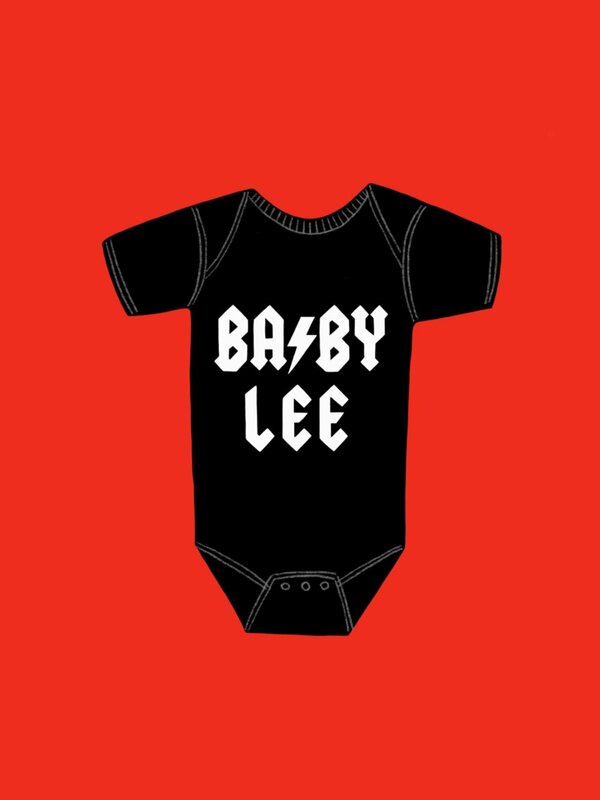 The couple had decided on a name for their baby and what better print for a boy's nursery.